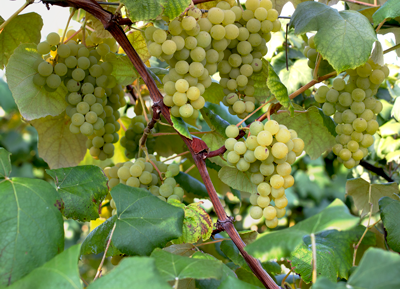 Developed in the 1880’s, Diamond resembles Niagara in fruit and Concord in vine, however it has a superior flavor and character (no strong foxy character). Diamond is one parent of Ontario, which is a parent of Lakemont, as well as Himrod. Diamond usually ripens in the second week of September on the Fulkerson Farm and we do make a varetal with it. As a dry table wine, it is one of the most distinctive and desirable of the American types and makes a great champagne style. Consistently well balanced, clean and fruity wine.